The U.S. Postal Service has previewed the New Year’s series of stamps highlighting NASA’s Planetary Science program, including a do-over of a famous Pluto stamp commemorating the NASA New Horizons’ historic 2015 flyby. Pluto Explored! In 2006, NASA placed a 29-cent 1991 ‘Pluto: Not Yet Explored’ stamp in the New Horizons spacecraft. 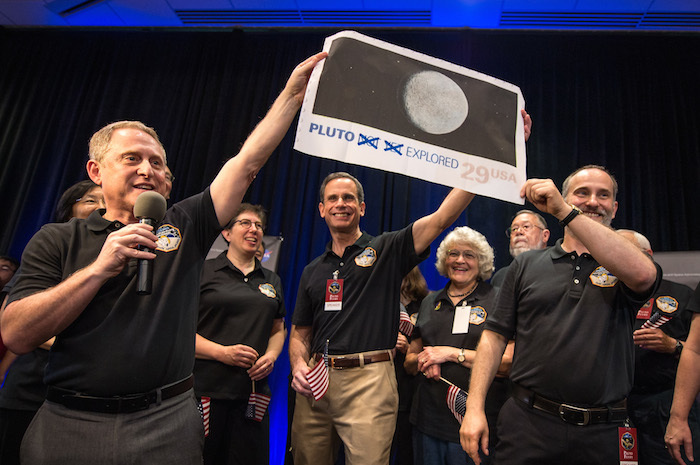 In 2015 the spacecraft carried the stamp on its history-making mission to Pluto and beyond. 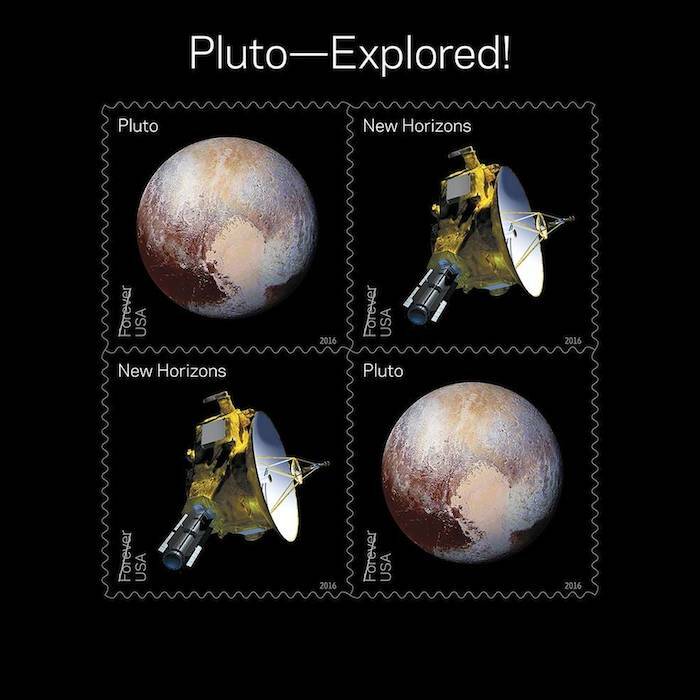 With this stamp, the Postal Service recognizes the first reconnaissance of Pluto in 2015 by NASA’s New Horizon mission. The souvenir sheet of four stamps contains two new stamps appearing twice. The first stamp shows an artists’ rendering of the New Horizons spacecraft and the second shows the spacecraft’s enhanced color image of Pluto taken near closest approach. 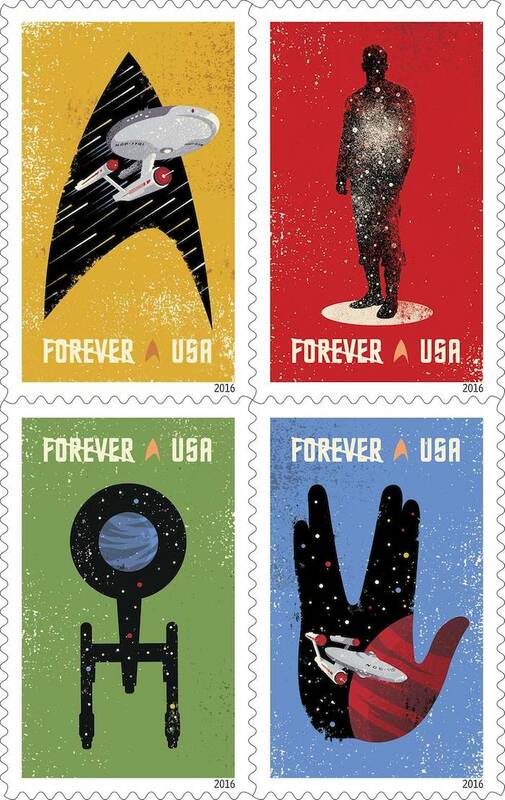 The Postal Service on Wednesday released a preview of its new 2016 stamps, which include an image of Pluto and the New Horizons spacecraft, eight new colorful Forever stamps of NASA images of solar system planets, a Global Forever stamp dedicated to Earth’s moon as well as another postal treat for space fans: a tribute to 50 years of Star Trek. Pluto Explored. (left to right): New Horizons Principal Investigator Alan Stern of Southwest Research Institute (SwRI), Boulder, Colorado; New Horizons’ Deputy Project Scientist Leslie Young, SwRI; Johns Hopkins University Applied Physics Laboratory (APL) Director Ralph Semmel; Annette Tombaugh, daughter of Clyde Tombaugh, who discovered Pluto in 1930; and New Horizons Co-Investigator Will Grundy, Lowell Observatory, Flagstaff, Arizona hold a print of the 1991 Pluto stamp –with their suggested update – on July 14 at APL in Laurel, Maryland. With this pane of 16 Forever stamps, the Postal Service showcases some of the more visually compelling historic, full-disk images of the planets obtained during the last half-century of space exploration. 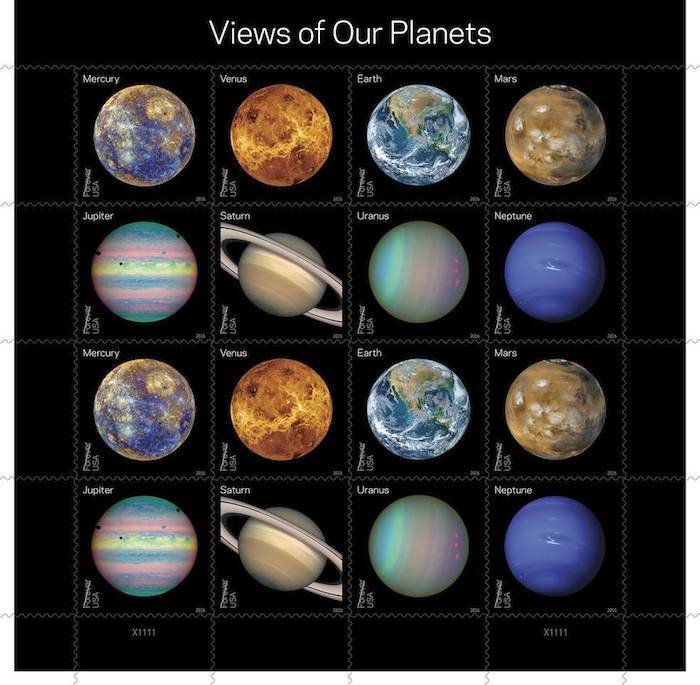 Eight new colorful Forever stamps, each shown twice, feature Mercury, Venus, Earth, Mars, Jupiter, Saturn, Uranus and Neptune. Some show the planets’ “true color” — what one might see if traveling through space. Others use colors to represent and visualize certain features of a planet based in imaging data. Still others use the near-infrared spectrum to show things that cannot be seen by the human eye. Taken as the full moon rises, the image captures the brilliant surface of Earth’s only natural satellite. 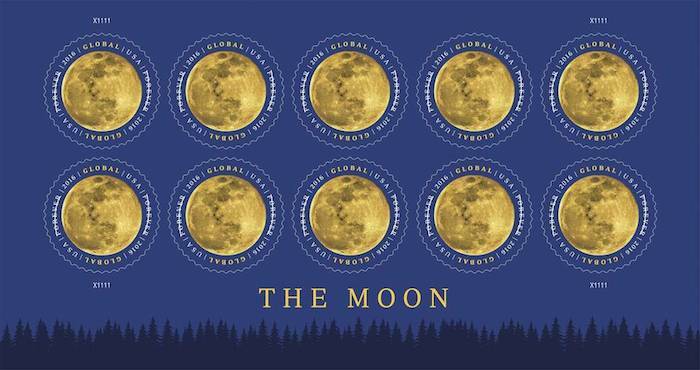 Issued at the price of $1.20, this Global Forever stamp can be used to mail a one-ounce letter to any country to which First-Class Mail International service is available. Celebrating the 50th anniversary of the television premiere, the new Star Trek Forever stamps showcase four digital illustrations inspired by the television program: the Starship Enterprise inside the outline of a Starfleet insignia against a gold background, the silhouette of a crewman in a transporter against a red background, the silhouette of the Enterprise from above against a green background, and the Enterprise inside the outline of the Vulcan statue against a blue background. The words “Space…the Final Frontier,” from Captain Kirk’s famous voice-over appear against a background of stars.